Today i did 2 diy projects i had been putting off. For some reason i abhor that acronym expression, but i suppose there's no other way to put it: i did it myself. First up, inspired by Chloé SS 09. These shorts had my heart in palpitations the minute i saw them so i improvised myself a home made variation, sort of fusing the two styles to create a leather cuffed pair. All you need is an oversized pair of men's leather pants - the oversized here is crucial in order to get that rippled high waist effect. Cut right above the knee and roll up to the desired length (i personally like mine very short so the cuff is tight enough to create that sort of bouffant). Don't mind my pj t-shirt... this is not an outfit, people, just me modeling the final product. ... I grabbed a pair of scissors and got rid of the sleeves of this dreadful denim jacket and voilà! (Not that this was in any way hard or anything). 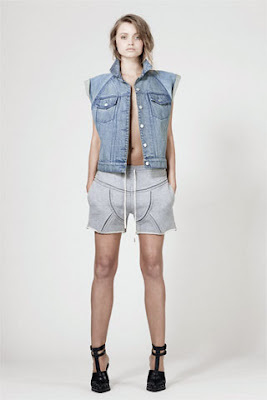 firstly, i'm shocked that you owned something that amanda bynes designed, and secondly, those shorts are amaaaazing. i did something similar with jeans but it did NOT turn out as nice as those. good job! The leather rolled-shorts are AWESOME! I may have to attempt this. this is sooo funny cause we have the same outfit! i have that h&m dress and i thrifted a denim vest and bleached it and i have worn it together lol! so awesome. and f a n t a s t i c job on those chloé-inspired shorts!